“Nobel Prize in hundreds of years across China” initiated by BIT in 2003 is designed to bring the owners’ spirits of innovation and pioneering to the researchers and the young through Nobel Prize Laureate Forum, Laureate visiting universities and Laureate dialogues etc. and we gain lots of supports from academic institutions and other walks of life. 50-100 laureates have being nominated on the future inviting lists. The spirit if Nobel Prize is encouraging the researchers and the young in China to pursue the top of technology and a brand new world in science. Up to now, over ten Nobel Prize Laureates Forums have been held in Beijing, Shanghai, Dalian, Nanjing, Xi’an, Tianjing and Guangzhou and these forums have actually being a platform to introduce international talents. 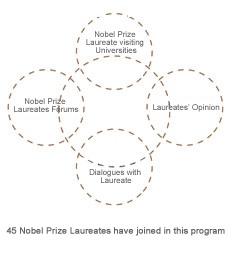 1、Nobel Laureates Forums: “Nobel Laureates Forums” not only afford the opportunities for the scientific and technical workers to communicate with the laureates on the advanced technology face to face, but also brings the latest scientific ideas which stimulate our domestic scholars to create the new things. These forums have become high-end communication platforms that gather the top talents from all over the world. 2、CEO Round Table Meetings: CEOs of the Global Top 500 companies will be invited on-site to have a discussion about the China's Economy and make suggestions to the industry development. These forums also provide a communication platform for exchanges and opportunities of common developments. 3、Governor Forums: This forum will invite the governmental elites to get together from different countries. And guests could listen to the experts’ advice and suggestions, their introduction of the trend of the politics and economy and other policies on science and technology. 4、City Development Forums: The Heads of the government from all over the world will come to this forum to promote the communication and cooperation with each other, jointly building the city conference brands and improving the development of the economy. 2、Investment Cooperation and Project Referral: To provide a reference platform for industry elites and seek a channel of transfer, investment and cooperation for industry projects in order to keep good project competitiveness. 4、International high-end Talent Exchange: To attract industry elites participation around the world, and to create an international high-end talent bank and an international job fair in order to seek for overseas professionals for domestic enterprises. 5、Investment Forum: Risk investment practitioners participate in and deliver speeches, and create an opportunity for abundant funds to invest in advantageous projects, to facilitate cooperation and achieve a win-win situation. 1、Young Scientists Forum: Gathering the scientific and technological strength of young scientists; stimulating the research enthusiasm of young scientists; supporting the growth of young scientists; facilitating scientific and technological achievements of young scientists. 2、Popularization of Science: Conforming to the trend of scientific development; carrying out scientific knowledge education for various groups of the society; raising the scientific literacy of our people; enhancing scientific research interest of younger generations; stimulating the creative enthusiasm of young people to study science and apply it to practice. 3、Exhibition of Current Academic Achievements: Launching an academic poster exhibition; inviting academic elites of different industries to participate in the conference; providing a platform to display their academic achievements. 1、Welcome Banquet: It is a significant gathering moment of all the participants. Well-known performing teams will present exciting shows. You can taste delicious food and wine, enjoy brilliant visual feast, and experience unique and characteristic cultural atmosphere of different places. 2、Tech-tour: BIT will organize our participants to visit local resorts, see around the city, feel its culture, and experience the unique natural scenery as well as the charming cultural landscapes of the city.